Another tipical chinease food made in one chinease kitchen. I can't resist the smell, the flavor of it, simple yet yummy. 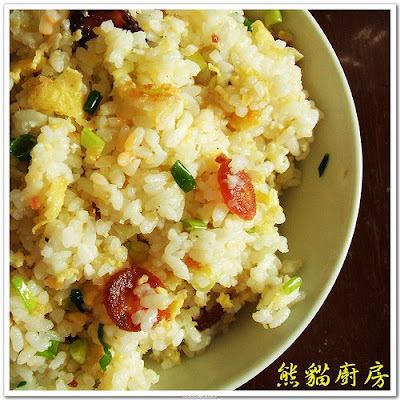 1, Leftover rice: the fresh cooked rice would not achieve this flavor since it contains too many water, keep out the water of the rice, that's the key. Some delicate restarants even use Carbon fire to drive the water out. That will make the rice tasty more wonderful. 2, Good skill with the chinese large frying pan over a high heat: The frying process need to be quick and wild, maybe move the pan up and down just like the chef would do. 3, Little green Onion is indepensible: little but important, it may add the good smell, unless you are allergic to this, which would be a great pity.